by later hand, lower right in brown ink: Vataux fec. (crossed out); by later hand, lower left in graphite: Watteau. Anonymous sale, (Paris, Hôtel Drouot, 28 May 1892, no. 72); Lallemand (sale, Paris, 2 May 1894); Léon Michel-Lévy [1846-1925] (his sale, Paris, Galerie Georges Petit, 17-18 June 1925, no. 106); George Blumenthal [1858-1941], New York (his sale, Paris, Galerie Georges Petit, 1-2 December 1932, no. 48); (Jean Seligmann). Mrs. Jesse I. Straus [née Irma S. Nathan, 1876-1970], New York, (her sale, New York, Parke-Bernet, 21 October 1970, no. 20); Armand Hammer Collection, Los Angeles, 1970; gift to NGA, 1991. Annotated sales catalogue in NGA library. The London Exhibition of French Art, 1200-1900, Royal Academy of Arts, London, 1932, no. 738 (commem. cat. no. 780). Master Drawings Selected from the Museums and Private Collections of America. Buffalo Fine Arts Academy, Albright Art Gallery. Buffalo, 1935, no. 60. Recent Acquisitions and Promised Gifts, National Gallery of Art, Washington, 1974, no. 71. Old Master Drawings from American Collections, Los Angeles County Museum of Art, 1976, no. 149 (Ebria Feinblatt). Master Drawings from the Collection of the National Gallery of Art and Promised Gifts, National Gallery of Art, Washington, 1978, p. 79. Watteau, 1684-1721, National Gallery of Art, Washington, 1984; Grand Palais, Paris, 1984-85; Charlottenburg Castle, Berlin, 1985. Washington, 1984, 109, 150, 379-380, fig. 2, no. 79 (Margaret Morgan Grasselli). Master Drawings from The Armand Hammer Collection. National Gallery of Art. Washington, 1987, no. 17. Renaissance to Revolution: French Drawings from the National Gallery of Art, 1500-1800. National Gallery of Art, Washington, 2009, 98-99, 280, no. 40 (color). Fourcaud, Louis de. "Antoine Watteau: Scènes et Figures Galantes." La Revue de l'art ancien et moderne 17, no. 95 (February 1905): 106. Les Maîtres du dessin. Paris, 1911: vol. 3, plate 136. Réau, Louis. "Watteau." In Les Peintres français au XVIIIe siècle by Louis Dimier. Paris and Brussels, 1928: 54, no. 38. Parker, K. T. The Drawings of Antoine Watteau. London, 1931 (reprinted 1970): 39, 49, no. 92, pl. 92. Eisenstadt, Mussia. "The Drawings of Antoine Watteau." Zeitschrift für Kunstgeschichte 1(1932): 239-240 (as Mercier). Parker, K.T. "Mercier, Angélis and De Bar." Old Master Drawings 7 (December 1932): 38 note 8. Adhémar, Hélène and René Huyghe. Watteau, sa vie, son oeuvre. Paris, 1950: under no. 170. Parker, K. T., and Jacques Mathey. Catalogue de l'oeuvre dessiné d'Antoine Watteau. Paris, 1957, 2: 326, no. 665 (with incorrect dimensions). Mongan, Agnes. Great Drawings of all Time, French: 13th Century to 1919. Edited by Ira Moskowitz. New York, 1962, 3: no. 686. White, Christopher. "The Hammer Collection: Drawings." Apollo 95, no. 124 (June 1972): 460, fig. 6. Zolotov, Youri et al. Antoine Watteau. Catalogues raisonnés des tableaux et des dessins dans les musées russes. Leningrad, 1973: 139, under no. 6 (1985 ed. : 98, under nos. 8-11). Posner, Donald. Antoine Watteau. London & Ithaca, 1984: 208, 288 notes 18, 19, fig. 166. The Watteau Society Bulletin, 1984, no. 1, p. 43. Walker, John. National Gallery of Art, Washington. Rev. ed. New York, 1984: 675, no. 1079, color repro. (as Couple Seated on a Bank). Börsch-Supan, Helmut. Watteau 1684-1721: Führer zur Ausstellung im Schloss Charlottenburg. Berlin, 1985: no. 91. Nochlin, Linda. "Watteau: some questions of interpretation." Art in America 73, no. 1 (January 1985): 80. Boerlin-Brodbeck, Yvonne. "La Figure assise dans un paysage." in François Moureau and Margaret Morgan Grasselli, eds. Antoine Watteau (1684-1721): The Painter, His Age and His Legend. Colloquy papers from the colloquium held in Paris in 1984. Paris and Geneva, 1987: 163 note 2. Grasselli, Margaret Morgan. "New Observations on Some Watteau Drawings." In François Moureau and Margaret Morgan Grasselli, eds. Antoine Watteau (1684-1721): The Painter, His Age and His Legend. Colloquy papers from the colloquium held in Paris in 1984. Paris and Geneva, 1987: 96 note 8. Grasselli, Margaret Morgan. "The Drawings of Antoine Watteau: stylistic development and problems of chronology." 3 vols. Ph.D. dissertation, Harvard University, Cambridge, 1987: 1:188; 2:272-273, 290 n. 72, 504, no. 193; 3: fig. 329. Grasselli, Margaret Morgan. 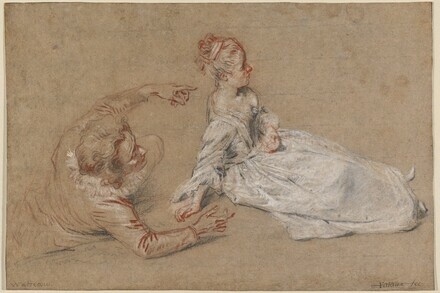 "Watteau's Use of the Trois-Crayons Technique." In Walter Strauss and Tracie Felker, eds. Drawings Defined. New York, 1987: 181, 183, fig. 3. 189, 194 note 24. Ingamells, John. The Wallace Collection. Catalogue of pictures, III, French before 1815. London, 1989: 351. Grasselli, Margaret Morgan, "News." The Watteau Society Bulletin 3 (1994): 54. Rosenberg, Pierre and Louis-Antoine Prat. Antoine Watteau 1684-1721. Catalogue raisonné des dessins. Milan: Leonardo Editore, 1996, 2: 792, no. 475. Wintermute, Alan, "Le Pèlerinage à Watteau, An Introduction to the Drawings of Watteau and His Circle," in exh. cat. Watteau and His World, French Drawings from 1700 to 1750, New York and Ottawa, 1999-2000: 29-31, fig. 21. Mittler, Gene A. and James D. Howze. Creating and Understanding Drawings. New York, 2001: 219, fig. 11.18. Stein, Perrin. "French Drawings, Washington," The Burlington Magazine 102 (January 2010): 66, 67, fig. 85.